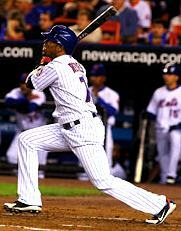 Jose Reyes homered in the first inning to give the Mets an early 1-0 lead in Game 5 of the NLCS. The Mets scored again in the 4th to lead 2-0. And then in the 7th, with 2 out Lo Duca delivers, driving in 2, to give the Mets a 4-0 lead. “Facing elimination, the Mets are,” they say. Right on, that’s grrrreat motivation. Final score — Mets win 4-2. It was a real thriller at the end. As the camera went around the stadium you could see the fans’ faces reflect the history of the team. Even when they were up by 4 we all knew it could go the other way. Mets fans are always surprised by a win, never surprised by a loss. CNET reviews MSIE7, released today. Add to the list of reasons not to switch — doesn’t run on Mac OS. Continuing the thread about news in the future, and what comes after Who Knew What When, I wonder if people caught that I’m trying to help. It may not be what you want to hear, but isn’t it my job, as it is yours, to say what I see, and tell you what I think? I hope it’s obvious that I think news reporting can be done better. A few simple guidelines follow, which I hope are helpful. 1. Encourage your sources to have blogs. One simple way to do that is to de-emphasize the phone interview, and take quotes straight off the blogs of experts in the area you’re reporting on. They’ll get the message pretty quickly, if you want to be quoted (and most people still do) it’s more likely if you have a blog. 2. If a person you’re quoting has a blog, point to it from your piece (if not from the print edition, from the web version). 4. Start your own blog, point to it from every one of your print stories. Even if you have no idea what you’re going to write there, start it, so you’re over that hump. 5. Float ideas for stories on your blog, much as you would with a person on your staff. See what kind of response you get. Most reporters don’t have a good feel for how their readers think, or even if people are reading their articles. If I were a professional reporter, this is what I’d want to know first. People throw around a lot of theories about what sells papers, but what do they base their beliefs on? When they say people prefer news about pedophiles to news about bribes and payoffs, they don’t really have a strong foundation for that belief. One common objection is that you tip off your competitors, but I think, really, reporters worry too much about this. Readers don’t care if someone stole your idea. And sure, there are some ideas you can’t float, for legal or ethical reasons, so don’t. 6. Back to sources having blogs, I’d consider hosting those blogs. This is an idea I’ve pitched to Martin Nisenholtz at the NY Times, first in 2002, and a couple of times since. How it would work — when a person is quoted in a Times piece, a few days after the article runs, a person from the publishing side contacts them, congratulates them on being quoted in the Times, and asks if they want a blog. No strings attached, you can say anything you want on your blog, no editorial review, and no cost to you. We get to run ads on your blog, they won’t be intrusive, much as we run ads on columns by regular NY Times columnists. The reason this works is that it includes the reporters in the vetting, ultimately it’s their decision who gets to blog under the corporate masthead, which is important in an organization where the talent is so important to its success. But they also have to deal with competiton from a new source, their sources. I think it’s really clever, and the first news organization that does this will have a leg up on all the others. 7. Finally, as you learn, share what you learn with your readers. Sure some will snark at you, but that’s been going on since the beginning of time (read the Letters to the Editor if you don’t believe me). And you’ll be teaching your competitors too, but that’s good — it’s called leadership, and everyone wants that. Basically, it’s been my experience that the more you share of what you learn, the more you will learn. Disclaimer: I am looking for a job as CTO or Chief Scientist at a professional publisher that wants to make a strong transition to the new environment. So here I practice what I preach, I’m floating ideas in advance of using them. That’s a great idea, Dave. I can totally see that working as a win-win-win. I’d turn the idea just 15 degrees (to the left, of course) and make it something closer to a message board. That way the source could initiate posts as you propose — just like they could on a blog — and invite comments, but the format also would allow for registered readers to introduce slants on the topic. >>Encourage your sources to have blogs. One simple way to do that is to de-emphasize the phone interview, and take quotes straight off the blogs of experts in the area you’re reporting on. That doesn’t sound much different from simply quoting a press release. Most sources aren’t going to share negative stuff on their blogs (despite the advice in Naked Conversations) or they’ll put it in the best possible light. IMHO, a good reporter draws out the source, encouraging (badgering, browbeating) her to give information and context beyond the official version. The phone interview, as a true p2p conversation in real-time, lets a reporter build some trust with the source before sneaking in the hard questions — and then publishing the answers. I really am enjoying your ideas for improving professional reporting. I used to be a reporter for a very small newspaper in Delaware. Long before there was an Internet. Or blogs. Your ideas and suggestions for the world of reporting today definitely make a lot of sense to me. I am in complete agreement with you that the more you share what you learn, the more you will learn. That has always been true. And I had no idea you were looking for a job with a professional publisher. That’s interesting news. Susan, I say the bug is in your process, develop trust in sources that have as much integrity as you have, who will tell you what they think is true, and disclaim their conflicts of interest, and you must triangulate, get the story from five different points of view, to form a picture of what’s true. You guys think you’re so good at getting the truth in the phone interview, you’re not that good, in fact there’s so much transcription error in the process that you’ll get a more accurate picture from reading blogs, even though you don’t get to ask direct questions in real time. The difference is that blogs aren’t written by PR people, btw. Macs, 308. Windows, 377. YouTube loves to hate the Win, too. Somebody had to defend the operating system that Windows ripped off, shamelessly, two decades ago. Nyah. Your RSS is posting funky results. The posts from October 2000 showed up in it today. That wasn’t Om posting about the MacBook. It was Liz Gannes. D’oh! Diego beat me to it. Not that Om’s not a good looking guy, but that avatar was way to pretty for Om. He says: “I’m going to tell you the blog postings that I regularly read in my RSS reader. I’ve communicated with many of the people who run them. They’re fabulous people, starting with…” Go read the rest if you’d like to see how this marvelous technology is spreading. Thanks Dave! Interesting in talking to you about your interest in a full time position — we are creating a new kind of media publishing company and I would love to talk to you about it. We actually met briefly last year at PC Forum as well. What’s the best way to contact you? I like that, at your fictitious, “I hope it will soon be real” newspaper or otherwise news collection and redistribution agency, you are not only cultivating better ways of collecting and reporting — but you’re working on the character of your sources and your readers at the same time, however subtly. I hope you find that job. Then I hope you need a couple of staffers. What a thrill that would be. > but isn’t it my job, as it is yours, to say what I see, and tell you what I think?